As we headed towards the Brecons I had a mixed bag of feelings about the forthcoming open Gold expedition. Jane and I were recently returned from the warmth of Spain and we were on our way to late Autumn Wales with a less than inspiring forecast. This was our last DofE expedition for 2011 and whilst it is a bit of a relief to be heading towards a break from tramping the wild areas of the UK in all weathers, looking for groups in sometimes awful conditions and sometimes picking up the pieces, it is also tinged with a real sadness that we do not have the rewards of seeing the groups succeed and achieving something that they are really proud of. The group assembled at the bunkhouse for two days of training and route setting, they were nice and cozy we ( Jane and I ) had the luxury of camping in the rain as the group size had grown ( as we had had some late joiners from Magdalene school ) and filled the bunkhouse. Day one dawned bright and sunny and the groups headed off towards Blorenge to spend the day adjusting clothing and rucksacks, getting to grips with navigation, getting to know each others abilities etc etc. We met then later on on the hill to cries of, gosh this is so much easier than our practice, this is really nice, I am enjoying this so much. Campsite was made just before dark and the groups set up, cooked and got to bed in really high spirits. The rain started at 0400 and by 0700 was steady and persistent. The groups were undiminished and elected a split by one choosing their foul weather and one choosing to stick with the fair weather route on the basis that the forecast was set to improve as the day progressed. This did not prove to be the case and whilst the group following the foul weather got into campsite just before dark the others found themselves, due to challenging navigation on the ridge ( couldn’t see jack ), putting up their tents and cooking in the dark. Everyone was more than a just little bit soggy and spirits were undoubtedly damper than the previous evenings sunny delights. Day three was a stunner, one of those fabulous late autumn days you are sometimes lucky enough to blessed with and even luckier to be out on the hills on. With the sun on their faces and their clothes, rucksacks and kit steaming the sheep watched on ( somewhat amazed ) as they strode on across the high hills with spirits to match. A cold night gave the guys a final kicking but they still managed to pull themselves from their sleeping bags at 0530 and get out on the hill by 0630 to finish at Abergavenny station by 1500. A great effort by all in challenging conditions and congratulations to those who were qualifying. 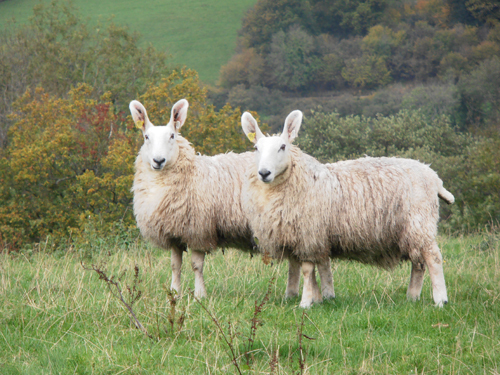 So back to Somerset and with an hour extra in bed courtesy of the clocks going back the winter closes in on us. Hoorah, time to get out the axes, sharpen the crampons and look out the gloves, balaclavas, thermals, four season sleeping bag all the paraphernalia of winter. Now I can look forward to snowy scottish hills, cold hands, the hot aches, starting and finishing in the dark, spindrift down the neck etc etc. But not yet, next week we are off to Greece for a two week bus mans holiday, climbing on Kalymnos, what else. An October Expedition D’Or or Spanish Gold. 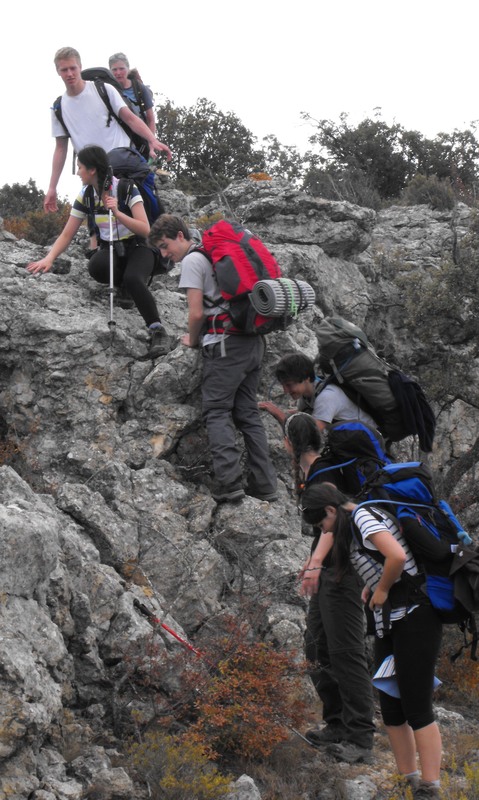 When Ibstock place school teacher and DofE Co-Ordinator Matt Lalor approached us for ideas for an alternative and somewhat warmer venue for their October DofE Gold qualifying expedition I had not a moments hesitation but to suggest the Serra de Prades national park in Spain. Situated to the south west of Barcelona it is a high plateau, 1000m above sea level, which makes it just a bit cooler and therefore a tad more bearable at this time of year. It is also an area of incredible geological, historical and natural splendour, which makes it ideal and give endless possibilities for the groups project/aim. It is also crisscrossed with long distance footpaths, forest tracks and miles of difficult single-track which give fantastic opportunities to set routes in keeping with the requirements of the Gold award and the groups abilities. Jane and I had been working with a rock climbing course in the week running up to the arrival of the group and coping with the warmest October weather ever recorded in this area of Spain (30 plus degrees most days, why is it wherever we go just now it seems to be either the hottest, wettest or coldest ) However the temperatures had dropped to the mid twenties by the time the group arrived giving slightly better conditions for them. After picking the group up at Barcelona we drove south to Tarragona and Reus and from there climbed on the winding and tortuous road to the Mountain Refugio where we would spend the first day checking kit, food shopping and generally preparing for the four day expedition ahead. The nights were cool and noisy as we seemed to have a wisdom of squabbling owls inhabiting the branches of the trees just above the tents, combined with the foxes yapping to each other and the wild boars snuffling about the nights were entertaining to say the least. Day one of the expedition dawned slightly hazy and comfortably cool and the group made their way out onto the high sierra to challenge their navigational skills. The paths at first were easily followed but soon deteriorated into faint single track marked by the occasional rocky cairn. The descent to the village of Capafonts gave some challenging little rocky steps but good teamwork saw these dispatched with ease, if not with just a little nervousness. From there it was downhill onto the northern edge of the park and the first nights camp. The next day saw a stiff climb in shimmering heat back onto the high plateau. The path at first wound its way steeply through thickets of Holm oak ( This area is the largest remaining Holm oak forest left in Europe) and then dropped into the autumnal coloured and heavily laden with fruit vineyards of the Priorat region to finally climb again up to the once moorish village of Siurana. This was a hard day for the group but the reward was a fantastic sunset over the Monsant mountain range which coloured the sky as beautifully as the autumn colours on the trees in the park. The next day ( Day 3) the group spent an hour doing project work in and around the village which is perched dramatically on the top of a high cliff. before setting out on a traverse of the cliffs and then dropping into the dramatic limestone gorge which runs for many beautiful miles back towards the eastern edge of the park. Legend would have it that the last Moorish queen of Siurana threw herself into the abyss rather than surrender to the invading papist army. I can only agree that no matter how hard this would have been it must have been a better fate for a woman than to have been taken alive by medieval soldiers, or any invading army for that matter. From the gorge the group made their way back towards La Mussara and a wild camp in the noisy woods. However no rampaging hoards of wild boars or masses of Owls having a hootenany would have kept these guys awake that night. The last day saw an early start to ensure that flight connections were made at Barcelona in the evening. A great effort from a fantastic team that were superb ambassadors for their school and the award. The rain drummed steadily on the windshield as I made my way down to Dartmoor. Two days back from the heat of India and after five weeks of blue skies I was questioning why I had come back to go to Dartmoor of all places. Arriving at the bunkhouse at Runnage Farm with the rain now horizontal and the campers in the field looking like discarded wet tissue paper, I at least had the comfort of the camping barn to retreat to. Over the next couple of hours the participants for the August open practice expedition arrived, I think maybe they were wondering why as well. The first two days were spent in the bunkhouse training and doing route planning whilst the rain continued to attempt to beat the roof tiles into submission and the hardiest of the campers gave up one by one to a lost bank holiday. Sunday, the first day of the expedition, we pulled our heads from sleeping bags to be greeted with blue skies lighting a soggy late summer moorland landscape. Warily we set out from Runnage farm navigating onto the moor and over Ryders Hill to our first wild campsite. The next morning again dawned bright and clear with a heavy dew on the tents and a cool ( for Aug) breeze but this was offset by the view of the moor alight with flowering heather and gorse in the early morning sun. Over the next three days the group gained in confidence and the weather steadily improved to be warm, sunny and with just enough of a breeze to keep what was left of the late summer midges off. 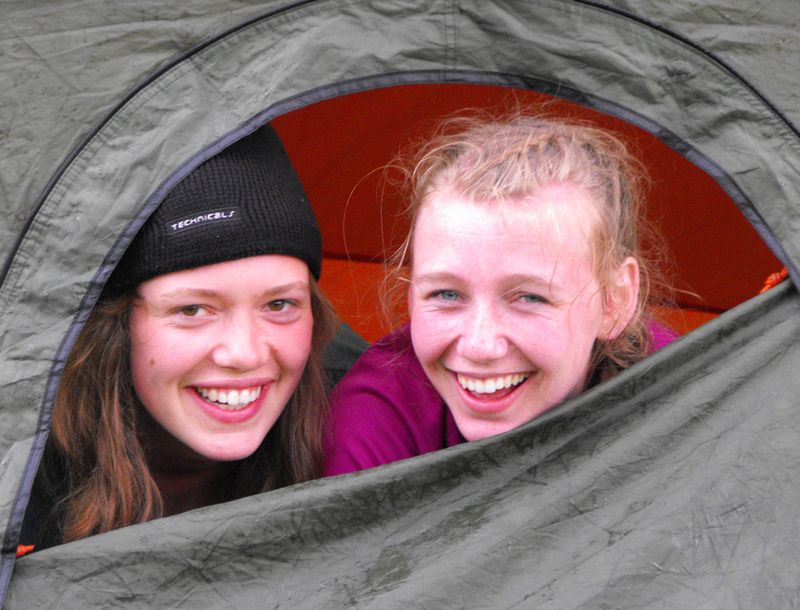 July has crashed into us at WCC with a frenzy of DofE qualifying and practice expeditions. The weather has ( so far) been excellant with temperatures in the high twenties and waterproofs remaining at the bottom of the rucksacks. Congratulations to the three silver qualifying groups from Monkton Combe who took a high route overthe Brecons, travelling approximately 20Km every day and camping wild every night. scorching summer sunshine. Also from Mortonhall was a group of gold walking qualifiers who criss crossed the main Brecons smiling, and singing sometimes, to triumph on gold. Well done to them all. Now its onto Snowdonia for the next two weeks of Gold assessed. Snowdonia was the venue for two back to back Gold assessed expeditions over the last two weeks. the teams, one from King Edwards School in Bath and one from Monkton Combe school followed a roughly similar route crossing the main Snowdonia range from north to south. King Edwards arrived first and although starting out in sunny conditions by the end of the first night the weather had deteriorated into heavy rain and blustery winds. The effects of this were felt by the groups as they were wild camped high in the Carneddau, so much so that some shelter had to be taken in the mountain bothy at Dulyn. Undeterred by lack of sleep the groups set off into increasingly heavy rain, some to cross Siabod (872m) others to traverse into the Ogwen valley. The two concluding days saw the groups crossing Snowden and the Glyders range. A great effort in some hard and challenging conditions. The completion of the gold qualifying for the Monkton groups was a very special event for us. We have worked with these groups since their bronze qualifying and seen them grow in confidence and ability over the last two years. Starting in the north of Snowdonia, at the coast, over the next few days they worked their way over Snowdonia taking in all the major mountain ranges ( Carneddau, Glyders, Moel Siabod, Snowdon and the Molwyns ) wild-camping as they went. There were rarely days of less than 9 hours but the three groups took these in their stride. 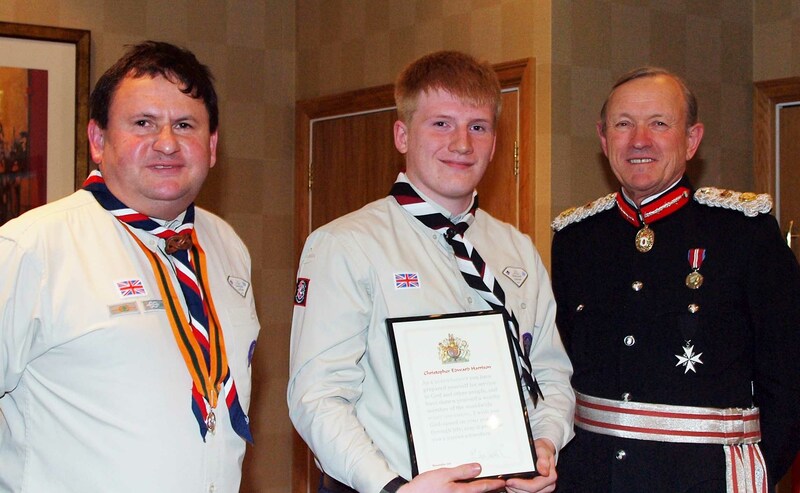 Teamwork, camp-craft, preparation were excellent throughout, Gold expeditions at the highest level, a credit to the award and themselves. Finishing in warm summer sunshine the groups headed off for a well earned BBQ at a hot shower at a bunkhouse in Bethesda. Our Brecon Beacons open gold expedition enjoyed somewhat unusual weather, four days of unbroken sunshine with temperatures in the mid twenties. After two days preparing for the expedition at Middle Ninfa bunkhouse the group set out over Blorenge to a luxury overnight camp at Park Farm. From there it was over to the main Brecons for an overnight high level wild camp where the stars in the night sky were uncountable and the only sounds were the wind, water and maybe the occasional snore before heading over to Penderyn and the use of Mr Williams riverside wild camp at Gelidafalog farm. Congratulations to Emily for whom this was the final step to her Gold award. It will be changed to Matt, cheers Chris. Chris and Jane taught us above and beyond what we needed for our expedition. They shared tricks of the trade and showed us exactly what to do, but also stood back to let us learn for ourselves, and from our own mistakes. In hindsight, we can see that we entered the practise rather unsure of ourselves, and with rather questionable campcraft and navigational skills, but the training we received was excellent and we definitely now feel prepared for the Gold qualifying to come. Not only did we learn a lot, but we laughed a lot too – Chris and Jane combined serious skills with a great sense of humour to pick us up after a long day of hiking. 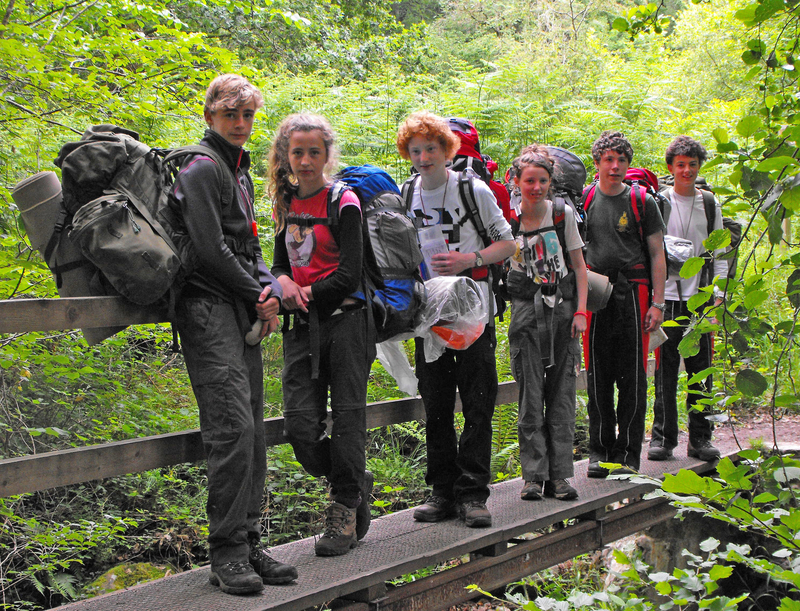 We would definitely recommend Wild Country Consultants to any groups wanting to do DofE in the future!